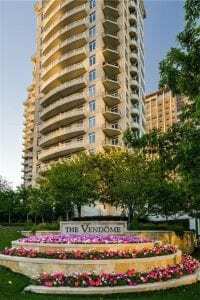 The Vendome is one of Dallas’s prestigious High-rise condos located along turtle creek boulevard and are exceptional in design. The Vendome high-rises in Dallas has exquisite finishes with one and two story floorplans, large floor to ceiling windows, condo units with wet bars, private studies, large guest suites and media rooms. Residents have conveniences such as large utility closets with a service entrance and excellent storage. Amenities include lavishly appointed lobby, concierge, wine cellars, private elevators, fitness room, pool with cabanas and much more. The Vendome offers Spectacular views of the Dallas Skyline.